We all remember our stationery from school: the smelly gel pens, the rattly tin pencil cases, the novelty rubbers and bendy rulers, notebooks covered with wrapping paper and novelty pencil toppers. Stationery may be a source of nostalgia for some, but for young children, bright and engaging stationery is actually of great importance. Just as a child chooses their favourite toys and sets, they’re more likely to engage with something if it’s in their favourite colour or personalised for them. We know the right stationery at work is crucial for the completion of everyday tasks. We should also realise that the right stationery for a young child can mean the difference between wanting to learn and frustration at the first hurdle. If you don’t know where to start, why not invest in a comprehensive stationery set that ticks all the boxes? 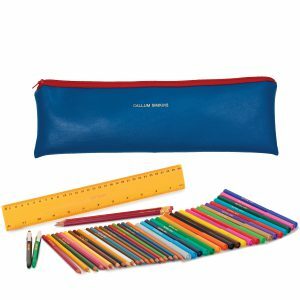 Each Mulberry Bush personalised jumbo zipped pencil case in red or blue comes with named pencils, pens and much more! A practical and stylish starting school or back to school solution. and enough sheets for an entire term. 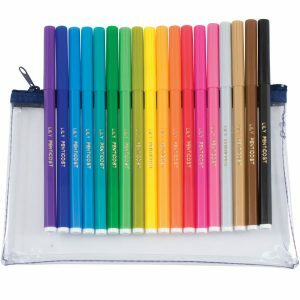 This best-selling 12-piece personalised HB pencil set is a hit with children and parents alike. 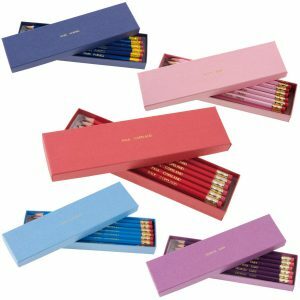 Each rubber-tipped pencil is presented in a named box for safe storage in an array of colours. A perfect item for a school bag or desk at home. 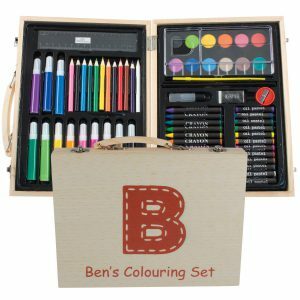 Inspire a budding artist as they journey through their early school years with our complete 63-piece art set, with personalised wooden case. Everything in the art set has been designed for little hands, with chunky pens and a simple paint set to start creating and designing – a brilliant gift for any beginner. The wooden box even comes with a strong handle for easy transportation. 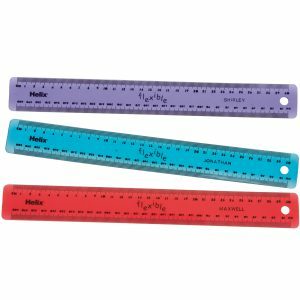 The bendy ruler never went away! In fact, here it is in our catalogue in an array of colours with added personalisation – a perfect accompaniment to any pen and pencil set. Every child needs a classic pen and practical storage pouch to get to grips with the art of writing. 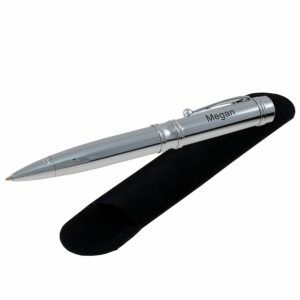 A brilliant tool for a child at school and at home, this personalised pen comes with a handy grip to slot into a shirt pocket on the go – a gift for any occasion! Some school trends never go out of fashion. 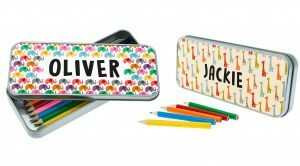 These perennially popular stationery essentials come in funky styles with bold personalised lettering, crafted in familiar, durable tin. The humble pencil case elevated to new status, which is sure to be a treasured possession for years to come. A quality notebook can always been complemented by quality note paper (20 sheets and 20 envelopes) for jotting down quick notes, penning letters to friends and family and quick doodling at the weekend. 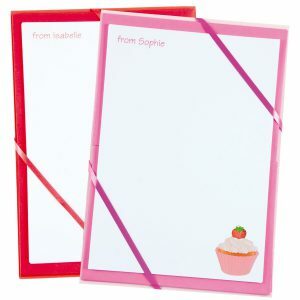 Mulberry Bush stock the most popular notepaper themes, from dinosaur and pirate motifs to cupcake and princess pads. Your child is sure to love these simple but effective sets. Provide your child with every colour they’ll ever need for an art of writing project with our 18-piece, personalised pen set, with a practical clear case for easy storage. Reduce the mess, increase the fun. 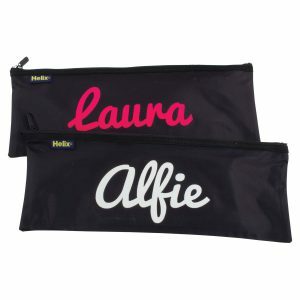 A large, durable pencil case with bold lettering for children who love stationery of all shapes and sizes. Our quality Helix pencil cases, in black nylon with zipped top, are perfect for stuffing inside an expanding array of school tools throughout the year. 10% off all personalised stationery for a limited time! 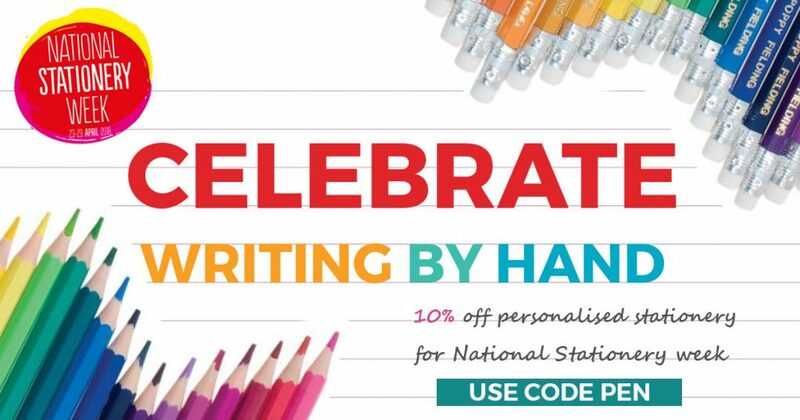 This month, we’re celebrating handwriting by promoting stationery in all its colours as part of National Stationery Week. We’re offering a 10% discount on our website until the 29th of April. 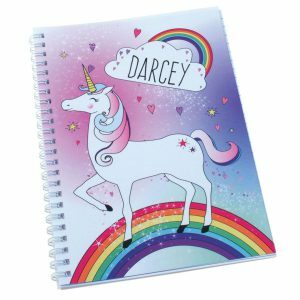 Simply enter the code PEN at the checkout to receive a discount for use on any of our personalised stationery products, from pens and notebooks to pencil cases and named rubber stamps – great additions to any school bag! Get involved with National Stationery Week on Twitter by using the hashtags #WritingMatters & #natstatweek between 23-29 April.